After the exhibitions in Rome and Milan, the initiatives launched in 2016 to celebrate the 150th anniversary of Italy-Japan bilateral relations continue in Bologna with the wonderful exhibition of Hokusai and Hiroshige titled "HOKUSAI HIROSHIGE. Beyond the wave ". Until March 3, 2019, it is possible to explore at Museo Civico Archeologico the fascinating world of Ukiyo-e - the Japanese art press, the iconic representation of the floating world - through a selection of about 250 works from the Museum of Fine Arts in Boston, for the first time available in Italy. The project, excellently curated by Rossella Menegazzo with Sarah E. Thompson and produced by MondoMostre Skira, develops in a very rich path through which the visitor can enjoy an aesthetically refined experience full of contents and insights related to the life and the artistic experience of the two masters. The audio guides, provided free of charge with the admission ticket, allow the visitor to fully appreciate the artistic significance and historical value of the exhibited works, accompanying the visitor step by step through exhibition spaces that with their elegant and essential design provide an ideal setting for prints (the only flaw is the lighting, which forces to a very close and sometimes laborious vision due to the reflections created by the glass that covers the framed works). The exhibition opens with a section dedicated to Hokusai and to his thirty-six views of Mount Fuji. The collection, published between 1831 and 1833 and rightly considered one of Master's masterpiece, is dedicated to the mountain, the symbol of identity of Japan, seen by different provinces and in different seasons, always the same and always new. It is an exercise of meditation, through which the author tries to capture the essence of time through the representation of the immobility of the mountain, as opposed to laborious human activities and the incessant renewal of nature. Part of the collection is the famous woodcut The great wave of Kanagawa. 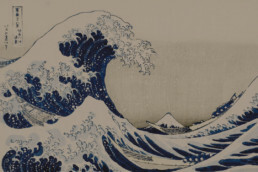 The exhibition approach cleverly combines, in a sort of ideal passage, the great wave of Kanagawa with the Hiroshige’s The Sea in Satta in the province of Suruga, made 28 years after that of famous teacher. The vision of the two works side by side allows the visitor to fully grasp the artistic value of the two authors and at the same time their differences. 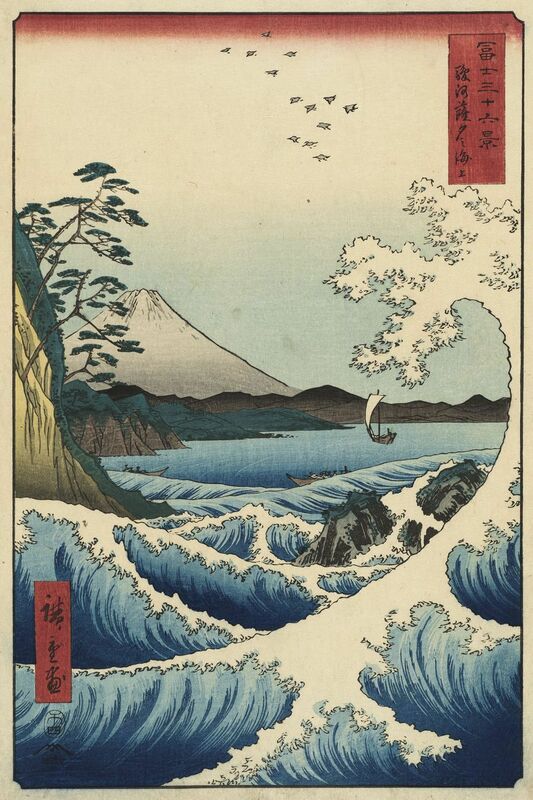 Hokusai represents his wave horizontally, in a sort of circular vortex, with the Mount Fuji appear very small in the background, impassive witness of the dramatic event that instead takes place in the foreground, represented by the unequal struggle between the boat of the fishermen and the superhuman power of the waves. Instead, Hiroshige chooses a vertical format, allowing his wave to rise upwards into the sky and dissolve into minute white foam, from which the birds in flight seem to almost originate. Here too there is a boat, seen in the distance while serenely sailing a peaceful sea, thus completing the picture of general harmony created by the natural elements in perfect balance. The exhibition continues with an exciting journey into the world of Utagawa Hiroshige through various thematic sections titled Travel Images, Tokaido and Kisokaido; Fish, Molluscs, Crustaceans and Herbs, and also Flowers and Birds; Views of Distant Places; Parodies and Humor and finally the Hundred Views of the Famous Places of Edo. The visitor can explore the entire creative universe rightly called "Master of rain and snow", because of the extraordinary skill and elegance representing the different atmospheric conditions. This ability is immediately evident in the illustrating i its historical as well as artistic significance. The talent of Hiroshige, constantly guided by an almost religious sensitivity towards the different manifestations of the natural world, is not detected only by his prodigious ability to represent landscapes, flowers or animals. The Japanese master has been a great innovator able to regenerate the classic way of representing the landscape through visual elements anticipating characteristic of the future photographic vision. His illustrations are in fact characterized by the striking photographic cut of the composition, made up of overlapping layers where large elements placed in the foreground capture the viewer's attention, leaving everything else small in the background. The photographic characteristics of Hiroshige’s works, the firm tract, the uniform color of backgrounds bordered by dark contours, absence of nuances and chiaroscuro effects, lack of symmetry, had great influence on the art of some impressionists and post-impressionists such as Manet, Monet, Degas and van Gogh. They showed their admiration by absorbing and reworking these graphic and elements or even explicitly citing them, as Vincent van Gogh did in the Portrait of père Tanguy using six ukiyo-e images as background for his character. 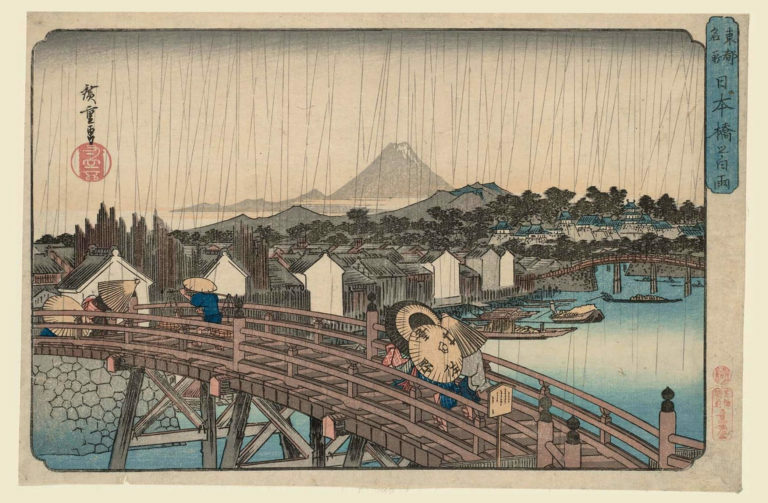 It is therefore particularly exciting to admire in the Bologna exhibition prints like "Shin-Ōhashi Bridge in the rain", "Susino in bloom" and "Inside the sanctuary Kameido Tenjin", appreciated by van Gogh and Monet to the point of inducing them to make copies, albeit reinterpreted according to their personal figure. 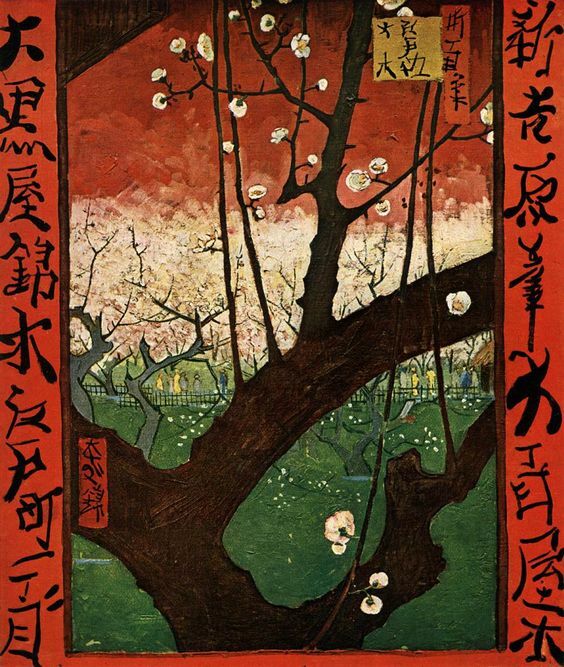 Ukiyo-e prints were originally imported in Holland by the India Company and exploded as a socio-cultural phenomenon in the West and in particular in France after the Universal Exhibition of 1885. 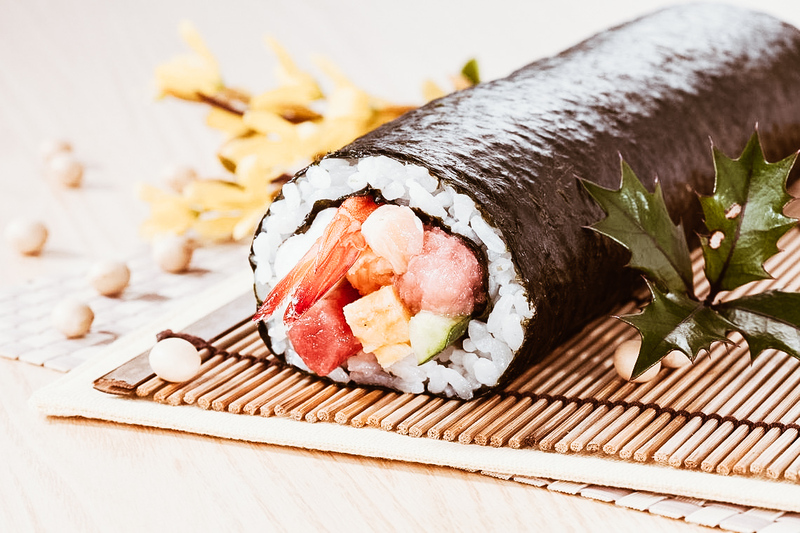 They became so influencial on the art and fashion of the era to determine the phenomenon that the engraver Philippe Burty in 1873 defined Japonisme. 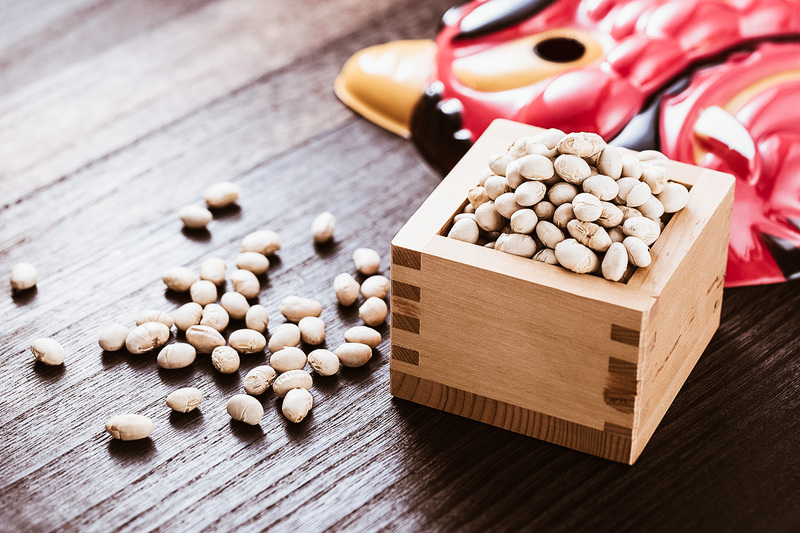 Inside the exhibition, for the first time, the visitor can see very rare works, such as the Indian ink drawings, preparatory work for the production of wooden matrices. 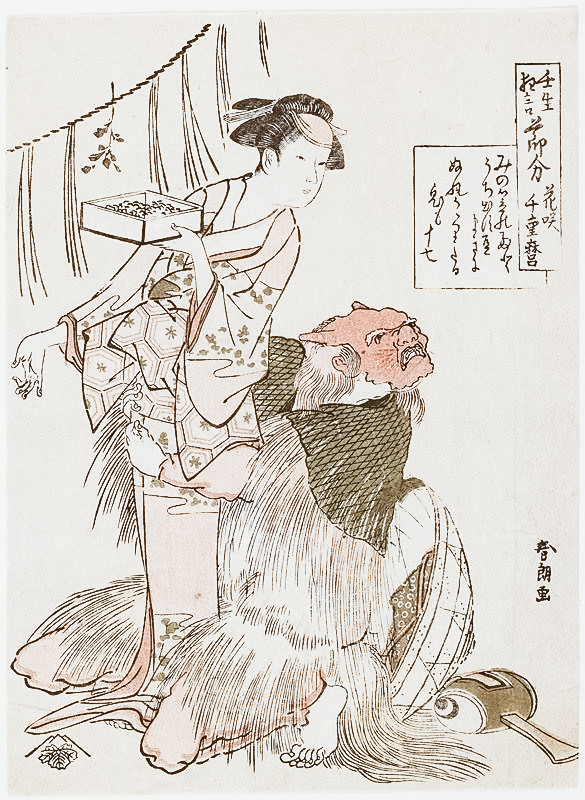 These drawings were in fact destroyed during the woodcutting process and it is therefore a rare and precious fact to be able to appreciate the master's original trait through them: fluid, safe, essential, surprisingly similar to that of the greatest mangakas (contemporary manga designers). The entire production process of the prints is also visible in an interesting video, projected in a special room, which completes the educational steps of the exhibition. 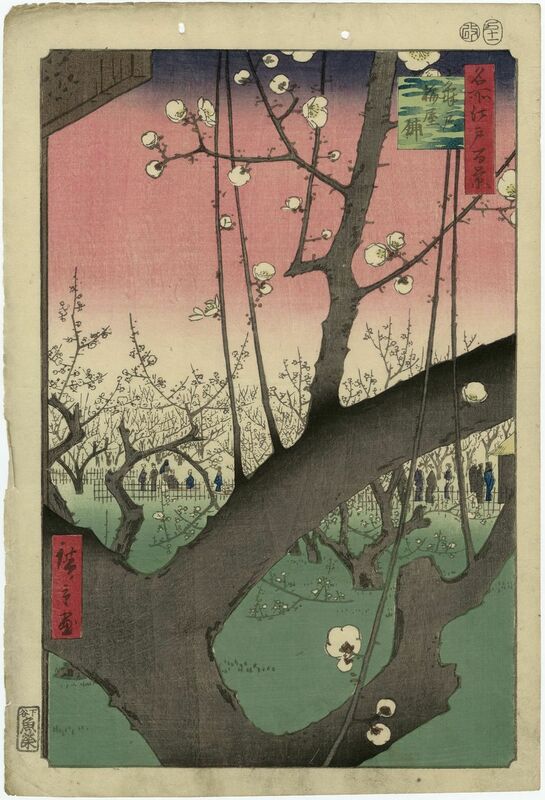 Hiroshige was considered a modern artist by his contemporaries for his innovative compositions of the landscape. However, he also dedicated himself to the traditional Ukiyo-e more requested by the market of the time, as the scenes of daily life of the nascent town social class in the most beautiful and known places of the time, in particular Edo (the current Tokyo). The last section of the exhibition, One hundred views of Edo's famous places is the most representative stream, the red thread linking the different creations of the masters of the Japanese art press. 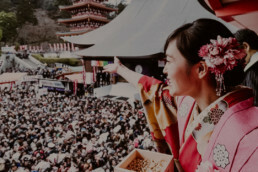 The Ukiyo-e ('images of the floating world') is a genre that flourishes in the Edo era in the pacified and prosperous Japan of the Tokugawa shogunate It responds to the taste of the rising city bourgeoisie, representing the new chonin lifestyle ( people of the city), the lifestyle of those artisans and traders who, thanks to their activities, now hold economic power, while the austere samuraic caste, more and more bureaucratized and less warlike, deals with managing political power. The Ukiyo-e is therefore an optimistic representation of that "floating world", of that palpitating life of the city, ephemeral and of short duration, which must be enjoyed in a sort of oriental carpe diem, plunging fully into its incessant current, in contrast ironic to the Buddhist ukiyo, indicating instead the 'world of suffering', the constant cycle of death and earthly rebirth from which the Buddhist monk tries to free himself. Also in this representation of the life of the city and its protagonists, Hiroshige excels, giving to his compositions the same sense of balance and harmony that pervades his depictions of the natural world. The Bolognese exhibition is therefore an unmissable opportunity to approach an artistic genre that has been fascinating the West for centuries and will not fail to conquer the neophytes, as well as to deepen the knowledge of a world maybe already known. In addition to the extensive information in the exhibit, it is in fact possible to take advantage of thematic guided tours, structured both for schools of different orders and degrees and for the adult public.